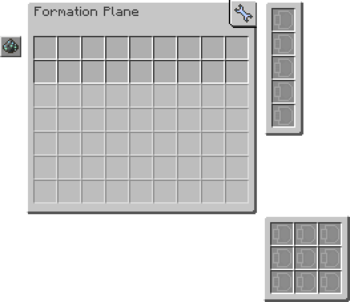 The ME Formation Plane is an item added by the Applied Energistics 2 mod. It has the ability to place or drop blocks and items newly added to the ME Network. It needs to be configured otherwise it will dump every item added to the Network. An ideal use in conjunction with ME Auto Crafting system is to place the Formation Plane next to water and configure it with Certus Quartz Seed and Fluix Seed, it will place the item in the water upon crafting it, so that it may grow. Blocks will be dropped as item. There is a Priority interface to set the priority in the Network. Up to 5 Capacity Cards to add 9 more items per card to the list. Split damage at 99%, 75%, 50% or 25%. An Inverter Card, to make the configuration list into a black list. ME Formation Plane has no known uses in crafting. Fluix Crystal can be substituted with Pure Fluix Crystal. This page was last modified on 7 July 2016, at 00:09.